I am going to be checking my ski on a flight this spring. I can’t fit a sportube into the car we’ll have in Florida. I am wondering if anyone uses a soft sided bag (such as a downhill ski bag) and pad the heck out of the ski/use a fin firkin inside. Any thoughts on this…risks I’ll run. I guess I would think breaking the ski would be unlikely and if it is adequately padded it might be okay…but that does not seem to be the consensus based on what I’ve read. Any thoughts? I fly to Orlando at least once a month. I use a 70 inch soft bag padded on the bottom. I pad the tip and tail. Use my vest and other padding for the top of ski. Never had a problem with a damaged ski. I am more worried about my ski making it to Orlando than it being damaged. One time imy ski showed up as I was leaving. It gave me a chance to ski on skies I would have never tried. I now know what skies I don't like. Thanks. Can you tell me what kind of bag you found? Is the bag big enough to leave the bindings on? I have a sport tube. When I run into the situation of a small car I take the ski out of the sport tube and break it down to it's smallest configuration, it then is about the size of a mid size suitcase. Thanks...I guess I didnt' realize they broke down like that. Good to know. covered with good old duct tape. Pieces for bottom, sides, ends, and top. Then insert towels, trunks, heater top etc for extra padding. 70 inch. Big in the bindings area. I can get wetsuit, belt, gloves, vest, all in it. I use the belt for a fin protector. I leave bindings on if I fly non stop. If I have connections, I take bindings off. Easier to find a stick to ride when you have your own bindings. @OB, for 8.00 per hour, they do not care about your ski. Most of the skinnys dont even know what skis are. @WBLskier, most small cars have the trunk opening into the back seat. Sport tube in half and run it through the trunk. Do not check a bag without a hard shell. 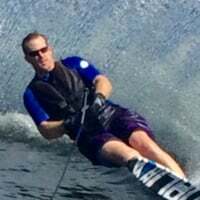 I just traveled to Ski Paradise using a Masterline roller ski bag. My skis made it fine, but the exterior of the bag went through some serious rough handling. Next time I fly I'll be using a Sport Tube. Just so you know this case is hardcase inside and softcase on the outside with a built in case fin protector and a hard fin protector. Will fold in half or you can remove the internal box. Fits eaily in compact car with ski inside between seats. I have traveled with a Masterline soft bag using towels, vest, rash guard, etc to protect the ski along with a fin block. It worked, but made me very nervous. The sport tube is better, although I worry that when the TSA guys put it back together they might not overlap the center section very well, thus making it vulnerable to folding in half. I use a wheeled soft sided snowboard bag and I haven't had any issues with my skis. Of course that doesn't mean I won't have a problem next time. I have borrowed a sporttube and broken it down like addressed above.